9 of 10: Birthmarked just was begging for me to like it. Strong heroine, dystopian world, mystery and intrigue, and a little romance. Of course I loved it. I’ve read a lot of advance copies YA fiction so far this year (most of it from ALA), much of it from debut authors, much of it HIGHLY hyped. And book after book has completely disappointed me. This is one of the few I’ve read that I really enjoyed. The inside of the cover of my ARC of this book has a letter from the executive editor of Roaring Brook Press and she could have pitched this book as The Hunger Games meets The Handmaid’s Tale, but she instead likes to tell people what happens in the first chapter. Since I haven’t read The Handmaid’s Tale, I’d say it’s more like The Hunger Games meets The Giver. Like the editor, the most convincing argument for this book is what happens in the first chapter – Gaia Stone is sixteen years old and helps her mother in her role as midwife. On the night the story begins, however, Gaia’s mother is elsewhere delivering another baby, and Gaia ends up delivering a baby on her own for the first time. Things go, happily, without incident and both baby and mother are fine. And then Gaia takes the baby from its mother and takes it to the walls of the Enclave. The law is that each midwife must turn in the first three babies she delivers each month and this is, of course, Gaia’s first. The book is set in the future, about 300 years. The world has been fairly desolated by famine, war, climate change, etc., and the outside world is pretty bleak. The Enclave was begun by a group of people who figured out how to raise food even in these ugly conditions and they built a wall around their city to protect themselves. Other people settled just outside the walls, looking for some bit of protection and have scraped out an existence since then, giving up their children as required by the quota. The children are raised by their adoptive families within the Enclave and, when they are thirteen, are allowed to decide if they would like to return to their original families outside the walls, but of course none ever do because life inside the Enclave is so much better. When Gaia returns from her first baby hand-in, though, she discovers that her parents are gone, taken inside the Enclave for questioning, and that a soldier is waiting in her home, anxious to find out what she knows (although she has no idea what it is she’s supposed to know anything ABOUT). As the weeks go by without the return of her parents, Gaia begins, for the first time in her life, to question the purpose and goodness of the Enclave. How could they have taken her parents, especially her mother, who has served the Enclave, delivering her quota of babies every month, so faithfully throughout her life? It’s hard for Gaia to be very inconspicuous as she begins making quiet inquiries, though, because of a large burn on her face, the remains of a childhood accident. She’ll have to be even more careful than she might have otherwise. One of the things that made this book really work for me was that it was all so realistic. The revelations about the Enclave weren’t huge, mind-blowing things; rather they were the types of issues that you could see really coming up in such a society. I’ve read a few reviews where people have been a little disappointed in these revelations, but I thought it really worked. And of course there was a smidge of a romance, but it developed slowly, which I liked. I will say right off that this is no Hunger Games. It doesn’t have that “oh my word, I cannot put this book down and as soon as I finish, I will force all my friends to read it” quality, but it is a really solid, well-written book. I enjoyed every moment that I spent reading, and I think it will have a solid fan base, but I doubt it will have the raging popularity The Hunger Games or The Giver have enjoyed. Apparently there is going to be a sequel, which I’m excited about, but this book can stand alone too, which I appreciate. 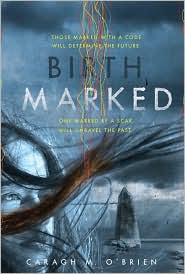 Advance copy of Birthmarked from publisher at ALA Midwinter 2010. You should read the Handmaid's Tale. It fits really well in the dystopia theme you're interesting in. This books sounds good, I'll have to see if I can find a copy somewhere! I love dystopias, but it seems like the YA market has been flooded with them lately – and most of them pretty mediocre. Therefore I'm excited about this one! Please please please read The Handmaid's Tale. And Oryx and Crake. And The Year of the Flood. I've been intrigued by this one since I saw people talking about it after ALA. Now, I definitely need it! Hmmm, sounds good! I'll have to order it for the library. Thanks for the heads-up! Dystopias seem to be having a big surge in popularity lately. My friend just told me how great Birthmarked is. Can't wait to read it!